Pushcart version of the ICONIC V-ITC. PUSH your way to profits! 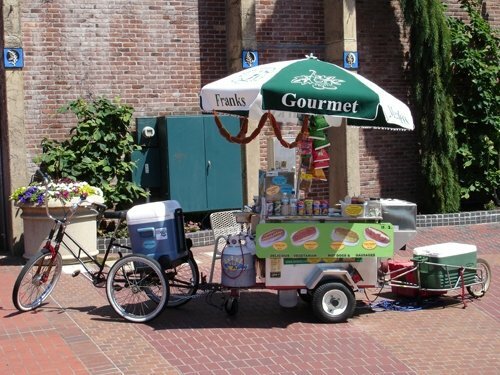 Same cabinet as on our V-ICT Ice Cream Tricycle but mounted onto a pushcart chassis. Featuring 8 cubic capacity and a single snap shut 10""x10"" thickly insulated door. 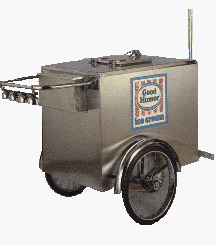 This classic cart which we've made for companies including Good Humor for over 50 years, is designed for use with Dry Ice (Shelf included on inside of cabinet) to vend pre-packaged Ice Cream Novelty products. Includes a Napkin/storage compartment by handlebars. Approximate capacity 30 Dozen. Ships via truck freight additional.